To those of you who thought Nick was the hero of this piece ... well, the teaser wasn't joking. See you all on Monday! 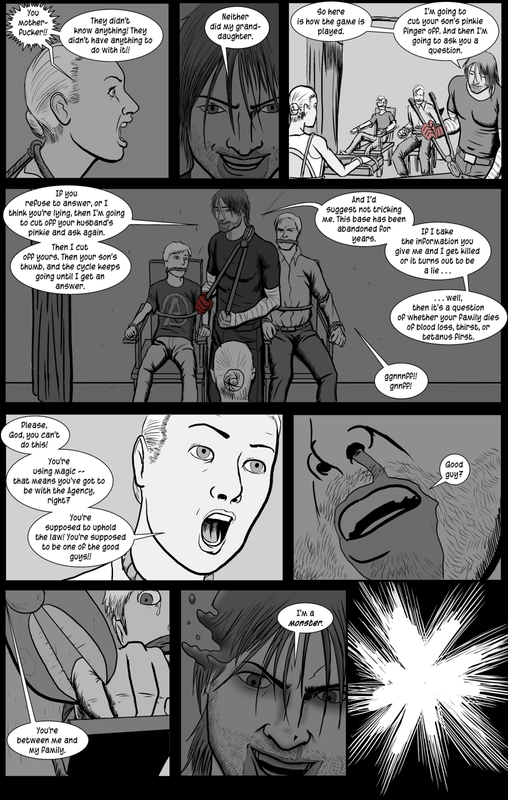 I promise there will be a lot less violence against children next update! Well ... I think he found her breaking point. How many times do the clippers go snap before her mind follows and she spills what she knows. Though I have a feeling Nick will do a similar thing to them as he did to Zan'Terrix and continue to torture just because he's that pissed off. And I, uh ... I don't think that's something you can threaten someone with, exactly. Unless maybe they're diabetic? Apparently, she now realizes that Nick is worse than she is, far worse than she ever dreamed anyone could be--and she has..... annoyed .....him. I think her previous statements pretty well established that she is extremely tough-minded and hardened to adversity. Doing a whole backstory would probably be overkill. Did Nick's head just explode?